Make delicious, professional quality sushi. With the rise in living standards and health consciousness, people have come to prefer lighter and healthier foods. Japanese food is becoming increasingly more popular because it is light, uses only the freshest ingredients, and contains virtually no fats or oils. 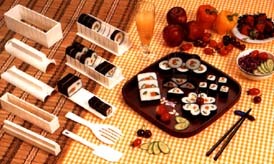 Of the many types of healthful Japanese foods, sushi is the most popular. With the guidance of outstanding masters of Japanese cooking we have devised the easiest way for you to prepare your own sushi at home. The 5-in-1 miracle Sushi Maker will let you make delicious, professional quality sushi with appearances even the greatest Sushi chefs would admire. The 5-in-1 miracle mold Sushi Master will let you prepare Heart shaped sushi as well as large, small, square , round, and triangular shaped sushi at home! SPECIAL OFFER FREE! SUSHI KNIFE!! 2. Place a sheet of sea weed into A. Add sushi rice evenly onto the sea weed in A. 5. Wrap the sea weed over the pressed rice and use C to press sea weed firmly into rice. 6. Use knife to slice between the gaps. Heart shaped sushi is complete. 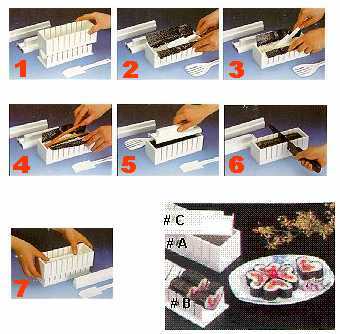 This set includes molds for making sushi rolls in the following shapes: Large square, small square, round, pyramid, and heart. A plastic rice paddle/fork and spatula are also included, but I'm assuming most people looking to roll sushi already have these utensils. The booklet included is interesting. It includes picture instructions of how to use the molds, which is great. It also includes an "interesting" assortment of sushi recipes.